Many mastiff breeders introduce themselves by sharing their story of when they saw their first mastiff and how they fell in love. I am no different. My name is Sarah Child. 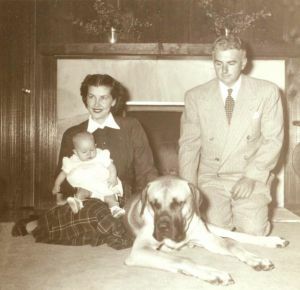 I am pictured here, sitting on my mom�s lap next to my dad and my first mastiff, Rudolph. The year of this photo was 1950. I was not quite six months old at the time. Rudolph was eighth months. 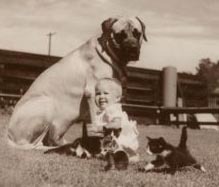 I was privileged to grow up in a family with mastiffs. I was adopted by a couple that already had a gorgeous male mastiff, the apple of my new father�s eye! My placement into this family apparently created quite a stir. The adoption agency and many of my parents� closest friends were quite skeptical of the success of my being placed into this particular home because of the �very large dog� that was already living with them. But my parents had waited so long on the list for their new baby that the agency made an exception allowing a trial period with many �surprise� visits. Legend has it, that one day the Agency Warden, as my mother called her, arrived for her random inspection. As a new, young mother, becoming somewhat weary of all these interruptions, my mother curtly told the woman, �Yes, of course you may see her, but she is napping.� She cracked my bedroom door open wide enough so the woman could peek in on me to complete her report. This woman gently closed the door, turned to my mother and said, �This will be our last visit. They seem to be getting on just fine together.� Rudolph was sound asleep, curled up underneath my crib, snoring. Over 50 years later, I still sleep with a mastiff right next to my bed, and admittedly, more often than not, upon my bed! My father saw his first mastiff in 1948, in Berkeley, California. And as we all have, he fell in love. After thoroughly researching the breed and breeders, he found Rudolph. Imagine doing this research without the aid of the Internet! He had a vision that children should be raised with mastiffs and so my heritage continues. My children, and now my grandchildren have been surrounded by mastiffs as they have all grown up. My grandsons are the fourth generation in our family to cherish these magnificent animals. Our family albums are full of pictures like the ones of Rudy and me with all the kitties. Please click HERE for more pictures of the past.